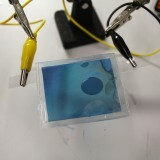 Electrochromic devices can reversibly change their colour in response to an applied voltage, offering us the ability to create glass or flexible films with a variable transparency. Electrochromic devices can reversibly change their colour in response to an applied voltage, offering us the ability to create glass or flexible films with a variable transparency. These materials are ideal for light controlling glass in architecture and for digital displays. Unlike many display technologies, Prussian Blue (PB) based electrochromic displays only require a small voltage to change their state, remaining in that state indefinitely without power. The low power needs and ease of fabrication of this material offers great potential for combination with energy harvesting technologies for architecture that adapt to both the weather and the privacy needs of its occupants without mains electricity. 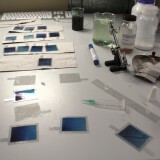 We followed the method outlined by Beloit College to produce simple DIY colouring changing flexible films. Prussian blue is one of the oldest known synthetic compounds, having first been synthesised around 1706. 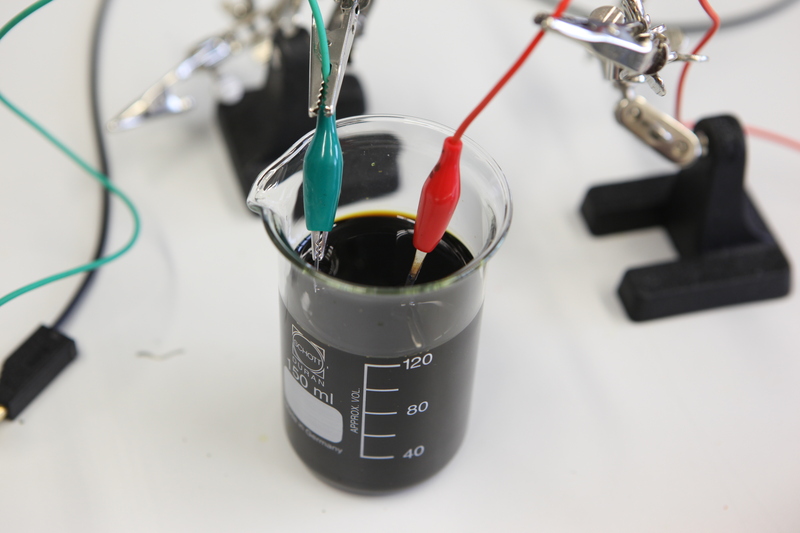 The water insoluble pigment has been used as a colouring agent for textiles, art and print for over 300 years, however it’s electrochromic potential wasn’t identified until as late as 1978 when it was applied to a conductive film with an applied voltage (V. D. Neff, J. Electrochem. Soc., 1978, 125, 886-887). PB changes from deep blue to transparent through a reduction reaction. 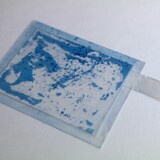 The chemical regains its blue pigmentation through the oxidation phase of the redox reaction (and then to green at its fully oxidised state if desired). 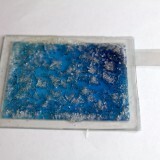 Through the repeated reduction and oxidation of PB it can change from blue to transparent indefinitely. We can prepare the PB film can by mixing Potassium ferricyanide and Iron (III) Chloride Hexahydrate to produce PB. 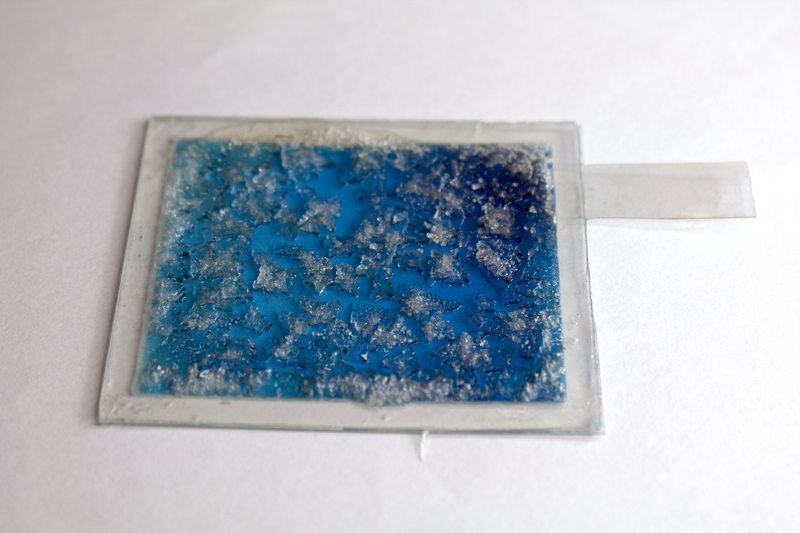 The particles of PB, which are dispersed in the solution, can then be deposited onto a conductive ITO film substrate through electrolysis. 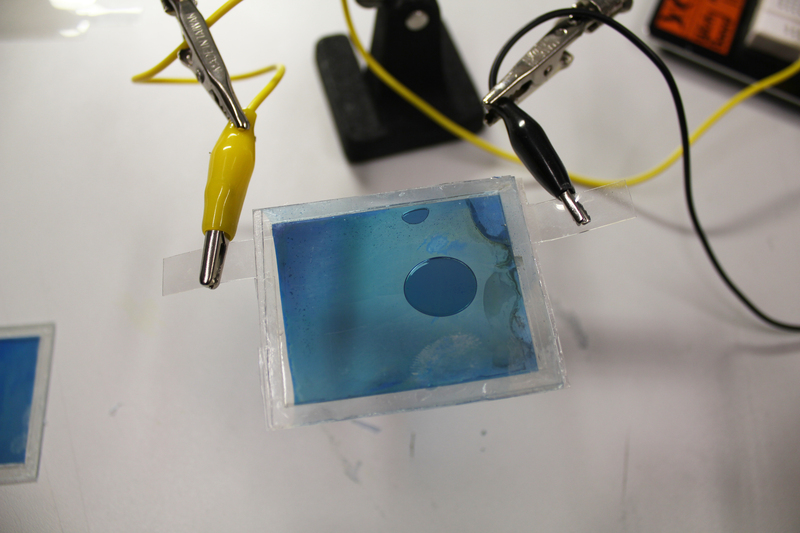 We then submerge the PB film in a KCI ionic solution with a graphite electrode. 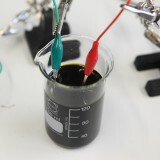 With a just AA battery between the two electrodes the colour changing redox reaction occurs. 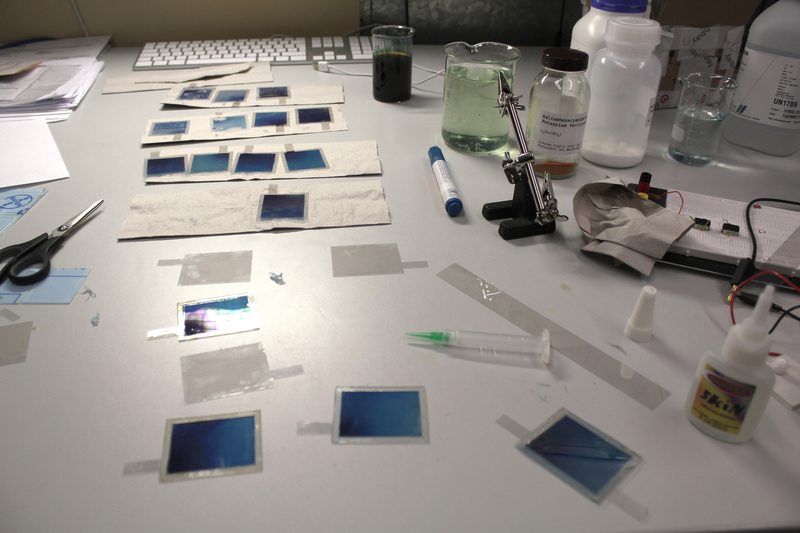 We are currently exploring different ways to improve the longevity and performance of the films and ways to produce enclosed cells with ionic gel solutions. 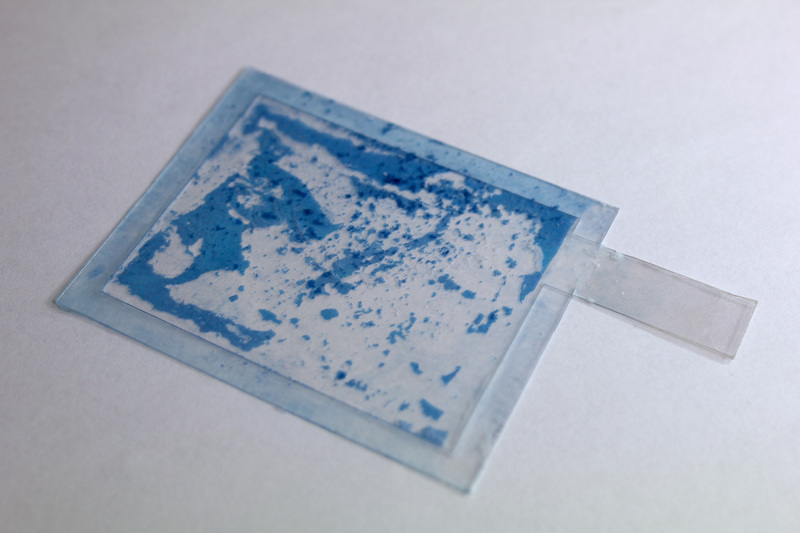 Although the Prussian blue pigment is non-toxic, the chemicals used in its fabrication must be handled with care. Potassium ferricyanide has a low toxicity, but it can produce a hazardous gas if mixed with a strong acidic solution, so it should never come into contact with undiluted hydrochloric acid, which is also used in the preparation. Iron(III) chloride is typically used for etching PCB’s and is both toxic and corrosive.